Security is relative. Will these steps make your server “secure”? It will be more secure than it was before. And more secure than most servers. Your server will not be “low hanging fruit”. Security is an on-going process. It includes settings, practices and procedures. Make it your business to regularly read about security and to understand the concepts and our system. Paranoia is useful with regard to server security. I’ve tested what is presented here in Ubuntu Server 10.04 (Lucid) and 10.10 (Maverick). If you want to harden your new Ubuntu server, this is a good start. Ubuntu server is well designed, regularly updated and relatively secure. 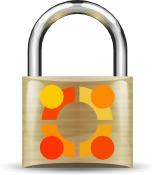 The Ubuntu Security Team manifests an onging effort to keep Ubuntu secure. Regular security updates are available and easy to implement. In this post, we are going to meet the security challenge in with multi-pronged effort that will include: system analysis, changing settings for additional hardening against attack, installing a firewall maintenance system, scanning for rootkits, and offering a regular maintenance regimen. This is only needed is ftpd is installed and running. Only if you’ve installed ftpd. However, it is Ok to do this anyway and it will remove a FAIL from the tiger report. SFTP is probably better than FTP, if it is usable for your files transfer needs. In the above example, ports for OpenSSH and Apache were opened by service name (“ssh” and “http”). You can use a port number instead of the service name (like “80” instead of “http”). It has been a while since Tiger has been updated. It still produces a useful report. You can modify psad settings to e-mail the admin in the event of intrusion detection. The safe-upgrade action is preferred by me because it does not upgrade packages that rely on dependencies that have not been upgraded to required levels. It kept spitting out errors about ‘sudo ls…’ not being found. So I modified the permissions of /var/log/tiger so that I could just grep FAIL /var/log/tiger/*securityreporthere* and shazzam! @Peter: Glad to hear it and well done! The security on /var/log/tiger/ is probably a bit much. It seems like it should have a group ownership of adm with rights to read the reports. I modified the instructions based on your experience. Thanks for sharing your knowledge. This is exactly what I was looking for. Thank you. This was tremendously helpful — broad in scope, with clear, succinct explanations. As the others above have said, this guide has been very, very useful. Thank you! You missed OSSEC in there (http://www.ossec.net) – It is open source and does all things the other tools you mention do. I would recommend using the grsecurity.net kernel patches to the linux kernel (http://grsecurity.net/ and http://grsecurity.net/~spender for the latest patch). This by itself locks down a linux server. It prevents non-root users from executing code outside of the bin directories (trusted path execution). It prevents buffer overflow exploits from executing code on the stack (no-exec stack). It prevents non-root users from seeing other users processes by making /proc read-only. So, if an attacker does actually gain access to the server, they really can’t do anything interesting. Note that tiger installs sendmail as a dependancy, which you might not want to do. No intention to plug, but you might like my open source project Lynis as well, to check how well the system is hardened and what other tips are available! Great Howto! Will these steps work on securing the desktop too, or is it too much/too little for locking it down? @John: Ubuntu desktop is pretty secure for a desktop. All these measures are based on what Internet-facing servers get hit with. Man, the number of attacks on some of my servers is unbelievable. @Andrew – That is what I have been reading about it security, I am not worried about my home system, but I recently loaded on an old laptop and am just trying to keep it nice and secure when I use public WiFi, I do always make sure to VPN back home just to be safe I can only imagine the amount of attacks you see on your servers though. I’ve got this message, how can I solve it without compromising installation? Because following this “Only allow admin users to use su” I’ve been locked out of my system. Needed a restore. Great post. Is this still safe to use two years later? Any better applications out now that you’d use instead? After this I can no longer access mu server from my mac via vnc server. Thanks for the great tutorial, straight forward now messing around, I am a newbie, although I have installed ubuntu server before I had never found a good site for quick secure set ups from the get go. Would webmin be a good interface to use outside of running manual system check commands from the server itself. Can you do this for CentOS 7 ?